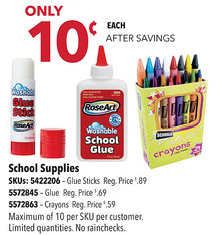 I bet not very many of you think of Best Buy as a place to go to get good deals on school supplies. However, there are some awesome deals you can score this week! The items I saw were all out of stock online, so head over to your local store for the best chance at getting these. Let us know if you’re able to find these at your store! You could also take the Best Buy ad to Walmart or Target and price match these items. Don’t forget the $1/3 RoseArt coupon. If you price match at Walmart you can get some overage.